Left To Right (clockwise): Rick Ross, J. Cole, The-Dream, Salem, Meek Mill & T.I. It&apos;s been a while since we&apos;ve had a day where every single song on our Shuffle playlist was a pretty big deal. Rick Ross dropped a diss track aimed at Young Jeezy. New material from J. Cole surfaced. Bloggers got their hands on fresh records from The-Dream and Salem. 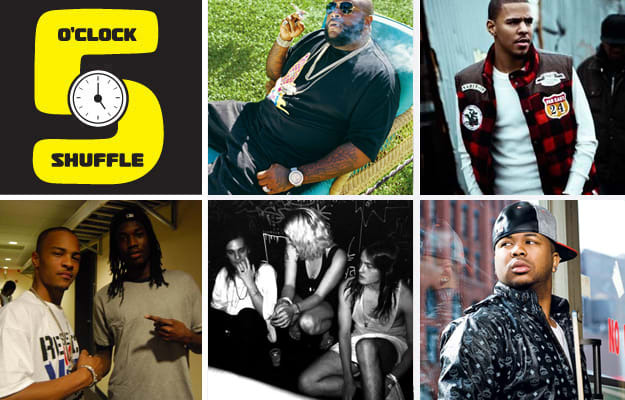 Rookie rapper Meek Mill got some big names on one of his songs, too. Solid lineup overall. Check it out after the jump and let us know what you think. • Rozay disses Jeezy, as expected. Wooooo! • Jermaine drops a new one about the desire to "make it." • Love King leftover, perhaps? • Dope album cut from the group&apos;s upcoming King Night album. • The Grand Hustle member gets an all-star cast to join him.